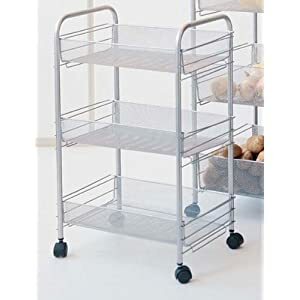 There are several types of carts you can use in your kitchen. This one has baskets, so the contents cannot fall out. This type of cart, with baskets, is better for smaller objects. For example, it is great if you want to hold fruits, or vegetables, such as potatoes and onions within the baskets. The cart has wheels, so it is very easy to move around wherever needed. In addition to its many uses in the kitchen, this would also work well in your bathroom, laundry room, or even a child's room to hold small toys.